Though I often brag about how much I like winter - the shoveling of snow and the beauty of the season - it is nice to get away for a bit. We’ve come to admire the aesthetics and culture of the desert southwest and seem to find our way here for short visits nearly every year about this time, either Palm Springs or here in Scottsdale. 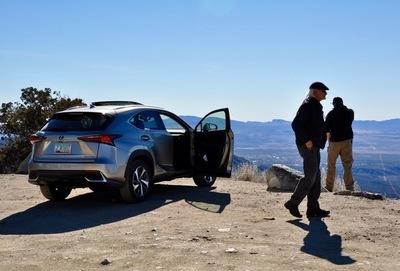 Our friends at Toyota/Lexus often accommodate our travel stories. In fact, our last trip here involved some off-roading in a Toyota 4Runner. (See that story HERE). 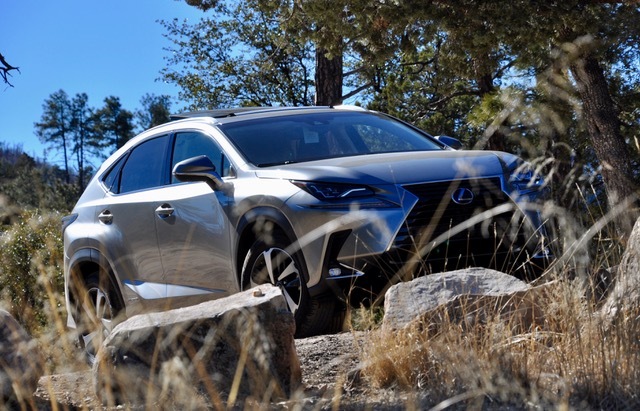 This year we’ve taken a different approach with the 2018 Lexus NX 300h, a small, luxury, hybrid crossover with lots of style and content. 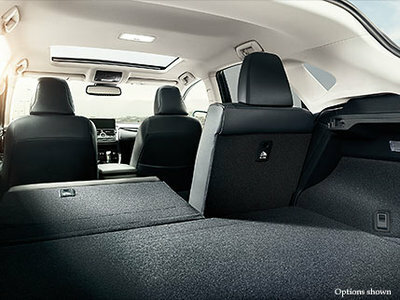 It comes with little off-road cred and about as much interior volume and cargo capacity as other compact crossovers, that is, not a lot. 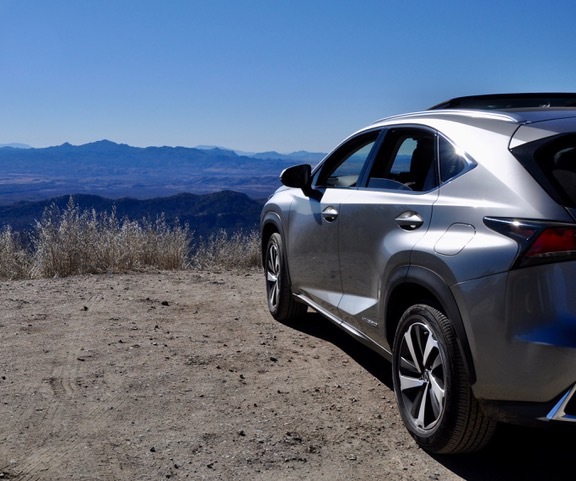 But the NX fits right in the upscale automotive culture of Scottsdale where you’re as likely to encounter a Tesla as a Volkswagen, and it makes a mighty comfortable and classy ride on back-country, modestly-maintained roads like the one we found just west of Prescott. 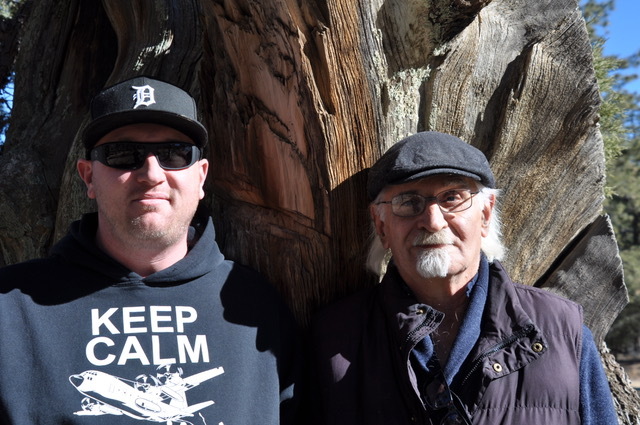 The three amigos are: this reporter, a consummate roadie; son Phil, a career Navy guy currently stationed in San Diego; and, our long-time friend, artist and desert guide, Mojave Moses (real name Phillip), who recently moved to Prescott where the Mojave and Sonoran Deserts merge. We all love the back roads and the discoveries made along the way. We’re all prone to indulging our creative, or right-brain, senses making for an eclectic mix of ideas, plans and insights. Our last off-road adventure was a challenging road up and over the mountain south of Idlewild, CA. This one will take us in a circle around, up and over the shoulder of towering Thumb Butte, just west of Prescott. 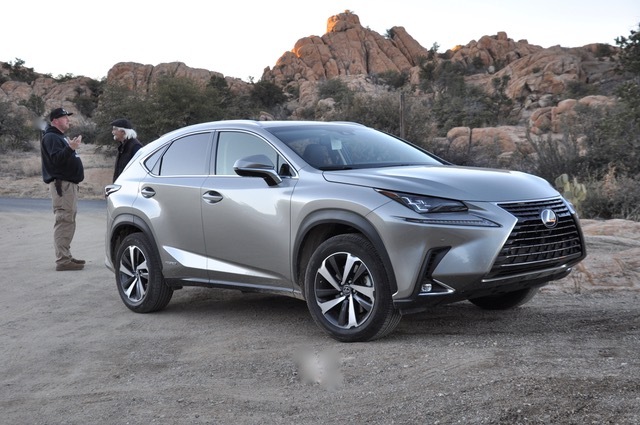 Our Lexus NX 300h tester is a striking color. They call it Atomic Silver. One of my trail mates called it “functional pewter.” It’s certainly one of the most photogenic colors I’ve encountered. The NX styling and design are also striking with angular protrusions, dramatic shapes and a confident stance. Big 18-inch, two-tone, alloy wheels with five double spokes imply action. 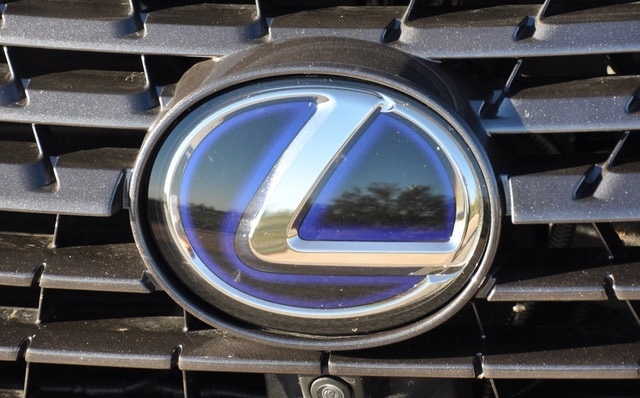 The gaping front fascia, deeply sculpted flanks and exuberant details around headlights and taillights bear witness to Lexus’ no-more-boring-vehicles design language. Inside we find a complex of shapes and lines and textures with an impeccable feel of functionality. Fit, finish and materials are what you would expect of a Lexus. The ergonomics are mostly good but I found the touchpad interface that manages many of the car’s functions, hard to get used to. The screen is small and the sensitive cursor moves too quickly for accurate moves, at least as we first felt it out. I find Lexus’ rocker-knob, used on many of its other vehicles, much easier to manage. Once we got used to the system, we became more adept at its management and more tolerant of what had seemed its quirks. 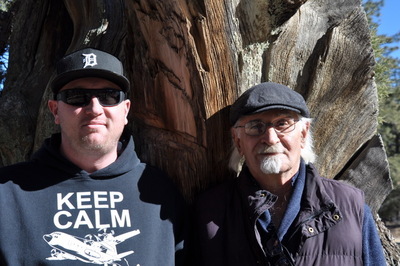 Our mission on the mountain road is to spend the mid-winter, sunny, desert southwest day exploring the nuances of the geology, geography, flora, and if we get lucky some fauna, of this unique ecosystem. The high temp will be in the mid 60s. Mohave Moses lives on the side of a small mountain on the south side of Prescott with spectacular views of the valley. As we pile in the NX it becomes obvious it’s too small for son Phil who is nearly 6’6” and shaped like a bull. But he managed to squeeze into the fully extended passenger seat. I’m about as broad in the beam as a tugboat but fit fine in the driver’s seat. Mojave Moses is as slim and trim as a vegan and had the rear seat all to himself. Our stops at vistas along the way gave us the full view of thousands of square miles of mountains and valleys – much greener than I had expected due to an unusually wet fall. Around the northeast side of the butte we could see the snow-capped San Francisco Peaks north of Flagstaff, probably 80 miles away. Giant, gnarly cedar trees drew us into the details of nature’s grandeur along with the seemingly infinite variety of colored stones on the barren floor of the thin forest. We found a little water in the road that we could splash through like a 3-year-old in a mud puddle. And, as we began our descent back into Prescott a brace of mule deer crossed our path. The NX 300h gets a trusty and efficient 2.5-liter 4-cylinder engine integrated with a substantial battery pack and electric motor on the rear axle making it full-time, all-wheel drive. Lots of technology make those systems work magnificently well together. 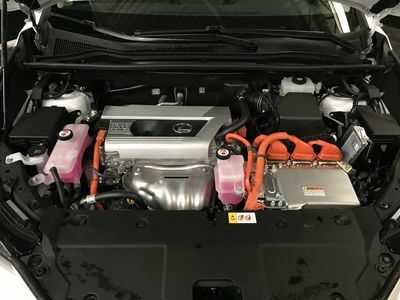 Toyota/Lexus have been doing this kind of hybrid longer than just about anyone. We can expect, the government says, to get a combined 31 mpg with this relatively lithe, 4,100-pound car, but our experience so far has been in the high 20s. Of course, anyone who knows me will not be surprised to learn I make little effort to maximize fuel economy with my driving style. Acceleration is much better at lower speeds because of the electric-motor’s torque. I would characterize it as adequate at higher speeds, though the listed zero-to-60 time is a tad over 9 seconds. 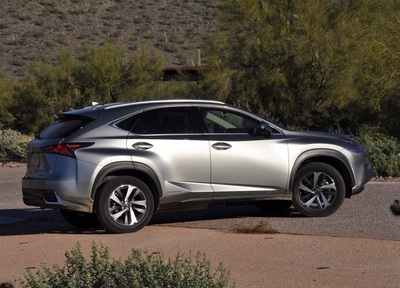 The 2.0-liter turbo version of the NX does much better in this regard. The transmission is a CVT, with shift points programmed in to feel just like a conventional transmission. You’ll still feel the CVT scramble on full throttle. The NX 300h Hybrid shows a base price of not much under forty grand and it comes in only one trim level that includes a good measure of luxury content. 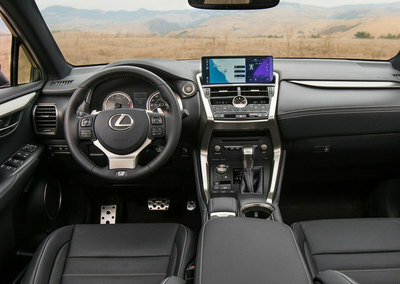 You can, if you like, load it up with options like the ones on our test car: an $1,800 Navigation Package that includes premium sound; a $1.500 high-tech LED headlight system; a $3,200 Premium Package; and an $800 panoramic, surround view camera that appears to show the car from a spot 20 feet directly above. We have a few more miscellaneous options for a total on our bottom line of $48,308. We finished the day near sunset at the “Granite Dells,” where heavily eroded, huge boulders of granite surround the small lakes (or big ponds) of Watson and Willow. Young Phil couldn’t resist climbing to the top of one pile of boulders while we old, wizened fellas stayed below to recap the discoveries of the day – the faces we saw in the patterns of rocks and trees, the amazing, colorful overviews of so many miles of alpine topography, and the insights we passed around as we contributed to each other’s projects. It was a day of profound insights, indeed.